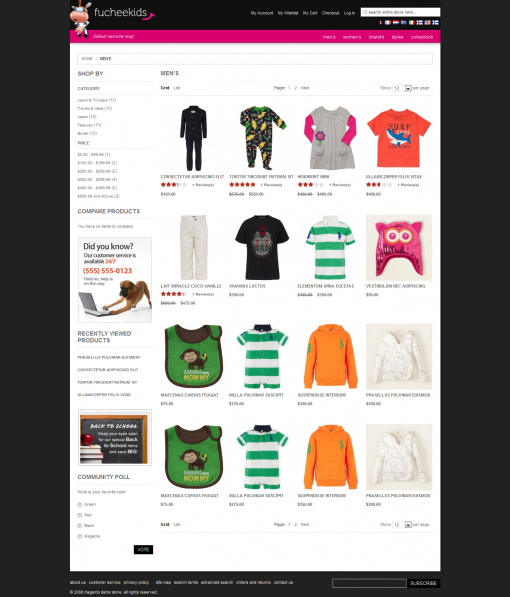 “FucheeKids” from Wizard Themes suits online stores for kids-such as those selling kid clothing, toys, furnishings etc. The theme is user-friendly and allows users to set-up an online account within the site from where they can manage their stored information, track orders, submit reviews and product tags and can also create a wishlist of products. The Magento admin panel in the theme supports design, layout and storefront customization with the easy to use interface that does not require any external coding. The theme is also SEO friendly and comes with included PSD files. Its cross-browser compatible and also comes with an opt-in box for newsletter subscription. The homepage comes in a textured black color scheme with a full-width image slider where you can include your featured images for new products, deals and discounts. You can choose to add text or images in the homepage, or can just go with the default view which just has a slider. The theme also allows you to add a custom welcome message in the header, and supports a custom logo. The theme comes with the below navigation and search options. A primary multi-level menu for your prominent product categories which can be managed from the theme admin panel. A top menu for account management and storefront links. You can also insert internal quicklinks within the footer block. You can include custom sorting fields in the sidebar for a specific category. The display would also include the count of the number of products for a particular option. Users can also compare products and also create a wishlist of products. The theme also has a keyword search box and an advanced search mechanism which allows users to search by multiple attributes. They can also check the status of an order by its attributes such as order number, email address used etc. The theme also comes with breadcrumb navigation for internal pages. Product pages come with support for multiple images along with a latest Cloud Zoom feature that allows users to see a magnified version of part of the image highlighted by the on-screen mouse pointer. This allows users to set their own magnification parameters rather than seeing the same image in a larger resolution. You can also add reviews, and can also have users submit reviews and product tags. The “FucheeKids” theme is free to download for a single site usage, but multiple site license would cost your $25.